As this school year draws to a close, I know a lot of teachers that are looking at their jobs with new eyes. Headlines regularly tell us about young people losing their way, resorting to senseless acts of violence. Social media apps sweep through school communities, allowing kids to anonymously post comments about each other. Many schools are losing recess time and art programs. All the while, teachers are scrambling to adjust to the new Common Core mandates and preparing for the state tests that will follow. And in many cases, kids are having a harder time paying attention to what we are teaching. As always, teachers go into their summers carrying big questions: Who are we teaching today? And what exactly should we be teaching them? What should we do differently next year? 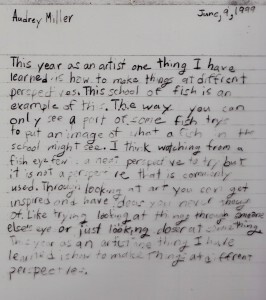 I’ve described Visual Literacy lessons many times in this blog. 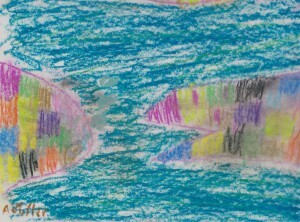 We already know that art helps us to increase vocabulary, inspire writing topics, and discover our literate voices. But the bigger picture is that art teaches us how to be empathetic. It requires us to step into each others’ shoes. When we describe what someone else painted, and listen to each others’ varied points of view, and connect to our peers by drawing our stories for them, we are doing what kids have less and less opportunity to do these days: making real contact with each other. 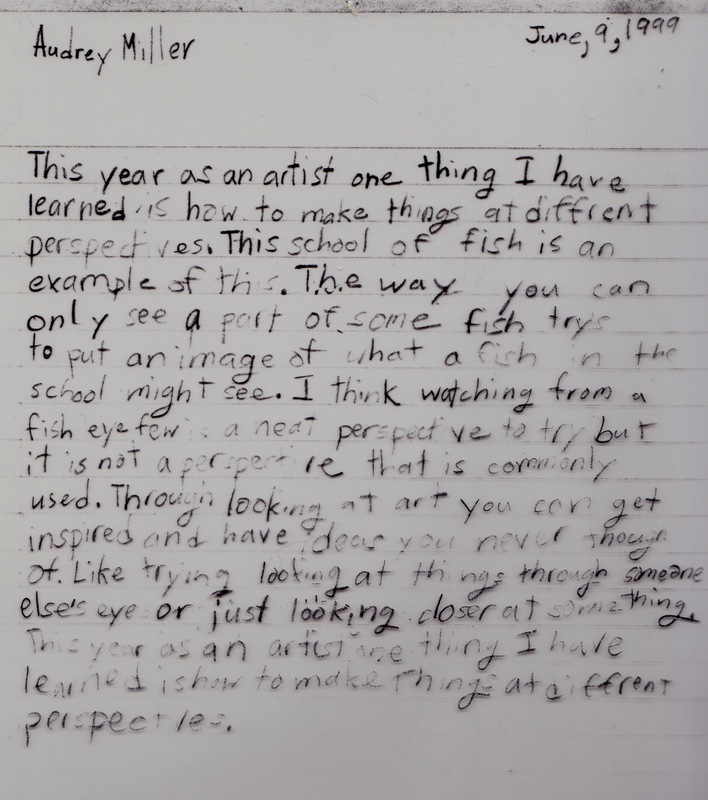 In the drawing below, Audrey, a second grader, finds a new way to look at a picture of a school of fish. John Dewey defined teachers as the key to community. Learning to see the world through each others’ eyes is key to developing a sense of community, as sense of belonging, and a conscience. I also experienced building a community in my classroom that consisted of children taking chances, stepping outside their comfort zones and pouring their hearts and souls into their reflections. They have so much to say…we have to listen. One of my concerns as an educator is less about what my students are seeing and more about what’s being SAID or DONE about what they’re seeing. It frightens me to think of the things kids see and the conclusions they may be drawing on their own because adults are afraid of, or don’t know how to, discuss or share information on difficult and scary topics. 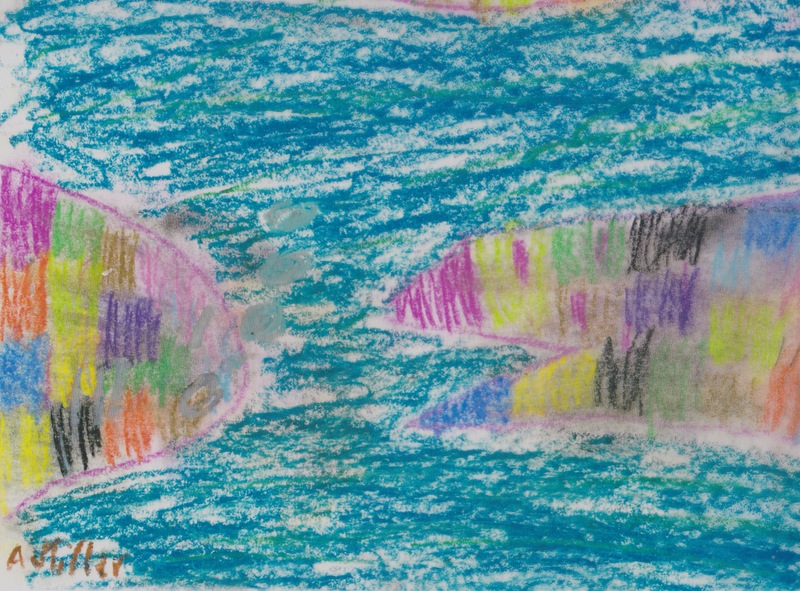 Visual literacy is proof of how frequently and deeply children connect their thoughts with things they experience. This connection between the written and visual languages is, I think, the heart of the matter. Fostering that connection between subjects, between my students, between students and myself, is not just a way to have them engage with Common Core content; it’s a method of teaching empathy, teaching resilience, and flexibility; it’s a mode of expression and potentially a window into my students’ lives. I see it as an absolutely essential part of schools and I hope it becomes a tool that schools rely on in the future!